There are a number of reasons to remove the rear wheel assembly from the motorcycle. Whatever the reason you need to remove the wheel, here is a set of steps to follow. 1. Place a piece of wood under the center stand and set the motorcycle on the center stand. This is for added clearance under the motorcycle when disconnecting the suspension. ( I used a 2X6 about 3 ft. long for this. You may also need a friend's help to get the bike on the center stand with the board under it. 2. Remove the air from the rear suspension. 3. This step will vary based on any accessories that may be attached to the rear of the motorcycle. On the stock version of the Aspencade, you will need to remove the chrome bar just underneath the license plate. It requires only a #2 phillips screw driver. 5. With the license plate out of the way, one final #2 phillips screw is left to remove the fender cover. 6. All that remains attached is a light bulb on the bottom of the fender cover. Give it a slight turn counter-clockwise and pull it out. You can then work the cover out the rear of the motorcycle. 7. Next, remove the four 10mm bolt holding the removable frame member behind the wheel. It may take a few taps with a hammer to remove after the bolts are out. 8. Move to the right side of the bike. Looking under the pannier you can see the connection point between the rear shock and the final drive unit. Remove the 12mm bolt. 9. Move to the other side and remove the 14mm bolt holding the rear shock to the swingarm. 10. While still on the left side of the bike, remove the brake caliper bolts. One is 12mm, the other is 14mm. Break the two bolts loose first before removing either bolt. (you will need them for leverage to break each bolt loose) Once the bolts are removed, loosen the bleed screw to release pressure on the pads. Be careful not to let any brake fluid get on the rotor. If this happens, make sure to clean the rotor thoroughly with brake cleaner. Then remove the caliper and support it off to the side with some wire or string. 11.Move back to the right side of the bike. Locate and remove the four 12mm nuts holding the final drive unit onto the drive shaft housing. These can be easily broken loose with a regular 12mm wrench. 12. Loosen the 27mm axle nut and leave it threaded on the very end of the axle. 12. On the opposite side of the axle, loosen the 12mm axle pinch bolt. 13. Using the axle nut to protect the threads, gently tap the nut with a hammer to start driving the axle through the rear assembly. 14. Once started, you can insert a screw driver through the opposite end of the axle and pull it out. You may need to leverage the wheel up a little as you finish pulling the axle out. Be careful to note the location and orientation of any spacers. There are two: one between the swingarm and caliper bracket, and another between the bracket and the wheel hub assembly. 16. Deflate the tire. (this is to allow clearance of the drive shaft housing when removing the wheel assembly) Work the final drive unit away from the drive shaft housing and roll the entire assembly out the back of the motorcycle. I have posted a video on Youtube showing this entire procedure. For some reason, it does not show up when entered into the search bar. Here is the URL for the video, simply copy and paste it into your address bar. Jesus Christ never taught that answering His call was a matter of convenience. It may well cost your life. New to the Goldwing family, I had to do some extensive research on how to remove the rear wheel so that I could put a new one on. Previous owner had the tire installed in reverse (backwards in the sense of the recommended tire rotation). Saw this posting and gave it a shot this afternoon. It has been removed! Some extra stuff that I had to do cuz my 1984 1200A has a hitch, and the supports that run all the way up towards the middle of the bike were in the way to bust loose the shock bolts, but that just added a few more minutes into my project. Thanks for the video posting and the narrative on the steps that it takes to do this task. Glad it was helpful. 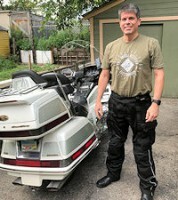 Welcome to the world of Goldwing ownership! It takes a bit of jockeying around, and it helps if you can turn the driveshaft a tiny bit now and then. On the GL1500, this is easy, because you have reverse (like shown in the video above). On the GL1200, you might have to have the bike in gear, and then have someone turn the engine over manually using the crank bolt at the back of the engine. While the universal joint is turning, you work the driveshaft up there to try to get it to move into the back end of the joint. It's really luck of the draw - I've managed to sometimes get it in in seconds on the very first try, and sometimes it's taken 15 minutes of pushing, wiggling and swearing. You don't need to push hard - just gentle pressure, and once you've got it lined up right, it will slide right in. I got my drive shaft to slide in all the way, but when I turn it, it makes a horrible noise, so it must not be fitting right even though it goes in. Suggestions on how to get it back in? I've already spent an hour trying.